Later this next spring or summer you will take off for the wilds of the great American West and experience a trip you will remember the rest of your lives! 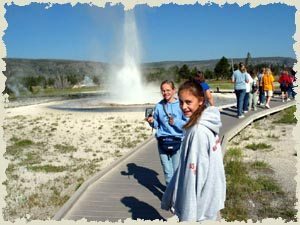 To make your Yellowstone experience more enjoyable I have some suggestions based on past Evans Middle School (Great Western Expedition) trips. 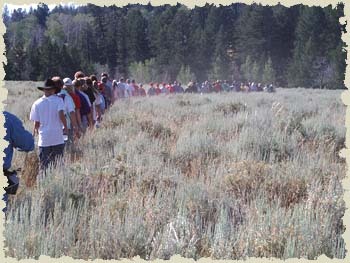 Sandals are ok around camp or in the hotel but most of the terrain you will be expected to walk through will vary from wooden boardwalks and paved walkways to rough, rocky, uneven trails with sage brush, tall grasses, weeds, flowers, and yes……sometimes horse and other animal droppings on the trail. A good hiking shoe or boot is best but tennis shoes generally work fine. If you decide to purchase a new hiking boot or shoe make sure you wear them often prior to your trip. Wearing a new boot on a rocky trail without first breaking them in is miserable and you will end up with blisters, but keep in mind that the tennis shoes you wear on a daily basis are just fine. Do Not go out and buy something you will only use on this trip. I have found that a good medium weight hiking sock will also help cushion the bumps on the trail and help to keep your feet cool and dry. You will be expected to hike and walk quite a bit so be prepared! and NO SNIVELING!! Shorts are ok around camp or in developed areas but when we are hiking in Yellowstone’s backcountry you will need a good pair of jeans or other long pants. Loose fitting preferably so that you can move and bend freely. I know bell bottoms are back in style but a standard relaxed fit boot cut jean works best at keeping weeds from depositing nasty, and itchy seeds onto your socks and they don’t weigh as much which you will understand fully about 4 miles down the first trail we hike. When we hike around Old Faithful you could probably wear shorts since we will be hiking primarily on boardwalks. Your chaperone will advise you on what to wear prior to each hike. Just accept it now, no matter what month you visit Yellowstone there will be bugs. I personally hate bug spray but you might want to carry a small bottle of bug dope. Generally how I defend myself is to wear jeans, ball cap and depending on the month a long sleeve shirt, and just deal with it! If you happen to be here in June expect more mosquitoes. July and August expect more deer and horse flies with scattered wet, cool areas with a few mosquitoes. The best way to keep the bugs off is simply to——keep moving! The average elevation in Yellowstone Park is 8000 feet. Because of this the humidity is very low, about 25 percent on average. Sweat will evaporate very quickly and because your body is used to breathing in air with a higher humidity level you will expel tons of moisture which you will need to replace constantly. Water also helps to counteract the effects of high elevation sickness. The amount of red blood cells that my body produces is nearly 2 times what your body produces because I have lived at this elevation for 20 years. Red blood cells carry oxygen and the more red blood cells your body produces the more oxygen it can carry and the higher you can climb in elevation before you feel the effects. Water helps decrease the effects of oxygen deprivation. In the past students have purchased water and just carried the bottles in their hands while hiking. This works, but I have a better idea and after doing a quick search online I found some affordable alternatives. 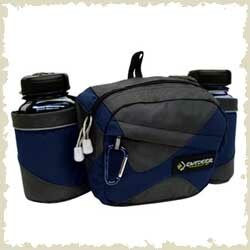 I found this small fanny pack with two water bottles for $14.95 at Campmor.com. Large enough to carry bug spray, pencil, paper, camera, extra film, candy or power bar. Plus you don’t have to buy water at $1.00 a bottle. Within a couple of days this pack will pay for itself. The weather can be VERY unpredictable in Yellowstone. I have had the temperature drop 40 degree’s and snow in August. However, more than likely the weather will be nice while you are here and probably be a bit warm and dry during the day but you can count on it being cool, to down right cold in the mornings. A light jacket or sweater will come in handy. I never leave the house without my rain gear. A cheap rain poncho bought for about $3.00 at Wal-mart will be all you really need and in a pinch a 30 gallon trash bag with a hole cut in the bottom for your cranium to fit through will work too but if you already own them, a rain jacket and rain pants work even better. Not only will rain gear keep you dry but they also help hold body heat. If you have to buy something buy the cheap rain poncho. More than likely you will not have to use it anyway. HINT: If you already have rain pants and jacket make sure the rain pants can fit over your shoes or boots without having to remove them first. This is handy when we are experiencing all four seasons in a day and we are putting on gear and taking it off as we hike. Your mom can easily make the needed changes to the bottom of a pair of rain pants if need be by making a straight line cut up the outside seam of each pants leg about 8 inches and adding a button, snap or velcro strip to the bottom of each to hold them together once on. Because the elevation in Yellowstone is high, the atmosphere is very thin and the sun index, or amount of ultraviolet light is very high. Sunburns are very common with visitors. Wear a good sunscreen and sunglasses. CD and Mp3 players are great during the long drives you will be experiencing in the bus but not on the trail. I need you to hear me. 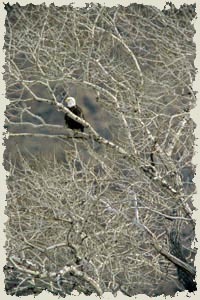 Binoculars can come in real handy for getting close up views of wildlife while you are in the bus or on a hiking trail. HINT: When deciding on a disposable camera or film for a standard 35mm camera, try to buy film or a disposable camera in the ASA 200 range. Disposable cameras with ASA 200 film are not as common but can be found even at Wal-mart or Target, you just have to look a little closer and read the labels. Most disposable camera’s come with ASA 400 or 1000 speed film! Great for the race track but terrible for beautiful scenic shots. The lower the ASA, the better, and clearer the picture will be. The higher the ASA film speed the faster the film. Great for stopping motion, and small 4X5 inch pictures but if you plan on enlarging any pictures to 8X10 or larger you will want a slower ASA film speed. I personally use Fuji chrome ASA 50 and can generally hand hold the camera without a tripod with a 60-200mm lens in good light and I can enlarge the picture to a massive 10 feet X 8 feet in size! The type of experience you leave Yellowstone with is totally up to you! Plain and simple. Most of you probably have not traveled much before this and will probably be the most exciting adventure of your lives. I expect you to have fun and learn while you are here and will do everything I can to make your experience in Yellowstone as interesting and fun as I can. In fact, at the end of the Yellowstone portion of your adventure you should be able to work any Visitor Center desk and answer any question posed by a standard visitor. That’s how much information you will be given………..its up to you how much you learn and remember. The answers to the following questions can be found among the pages within this web site. I have included hyperlinks to each page where the answers can be found. Prior to hibernating, 61% of all grizzly bears dig their dens so that the den opening faces in which direction? Fifty percent of all grizzly bear dens are dug where? What two specie of bears inhabit Yellowstone National park? What percentage of a bears diet in Yellowstone consists of vegetation? Wolves were reintroduced into Yellowstone using which type of release method? Which three packs of wolves were the first to be released during the winter of 1995/96? The wolves that were reintroduced , or transplanted back into Yellowstone were kept in fenced enclosures for 8-10 weeks. Why? #1: This allowed the wolves to get used to (acclimated) their new environment, and learn that there were no other wolves in the area. #2: It allowed the wolves to feel safer. #3: This allowed the wolves to recover from the stresses of being transplanted. #4: It allowed researchers to choose the best time when the wolves could be released successfully, such as when a large elk herd was walking nearby. #5: All of the above. The average wolf pack in the wild consists of how many members? 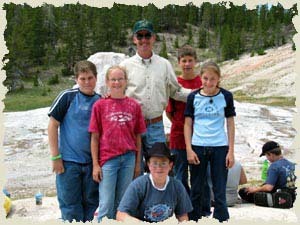 What year was Yellowstone National Park founded? Approximately how many different thermal features are found in Yellowstone Park? Which geyser basin is Old Faithful found in? Yellowstone, as a whole possesses close to what percent of the world’s geysers? What time in the morning do the rangers turn the geysers on? #5: None of the above. Describe in a paragraph or two what the number one thing is you hope to see and or do while you are in Yellowstone park this next summer? Do you day dream about hiking back to a lake and maybe spotting a moose? Would you like to see as many geysers as you can? Maybe you would like to see some waterfalls? I know everyone wants to see a bear and a wolf, but what do you dream about when you think of Yellowstone? And no. Hanging around the hotel, or cabin all day is not a good answer so don’t even think about it!